In accordance with its Policy Statement on Assessment of Senior Administrators, in February 2017 the APUO asked members in the Faculty of Arts to complete a survey to assess their dean. You can view the summary of results and the details of the quantitative questions by clicking on the appropriate link. This message was sent to APUO members on March 7, 2017. To see the original message click here. As part of Keeping Education Public week, the APUO is co-sponsoring events on campus from March 6 to March 10, 2017.Seven associations representing students, faculty and staff at the University of Ottawa come together to discuss major issues facing Canadian universities today.Several events will be taking place with a common thread drawing back to the austerity budgeting measures that have been implemented at the University of Ottawa and which are reflective of the current context of postsecondary education across North America.This takes place following threats of massive budget cuts of 4 to 8% at the University of Ottawa, including $2 million in cuts to library acquisitions which were narrowly avoided, and a freeze on university support staff, all of which undermine the quality of education for students, and the working conditions of faculty and staff throughout the university. Monday March 6th, the APUO will be hosting a roundtable discussion on the commercialization of academic publishing. As an increasing number of academic societies sign publishing agreements with the “Big 5”, these large multinational publishing houses drive industry trends that increase the cost of research and access to publishing, which adversely affects libraries that struggle to maintain their collections due to government defunding and austerity budgeting practices. 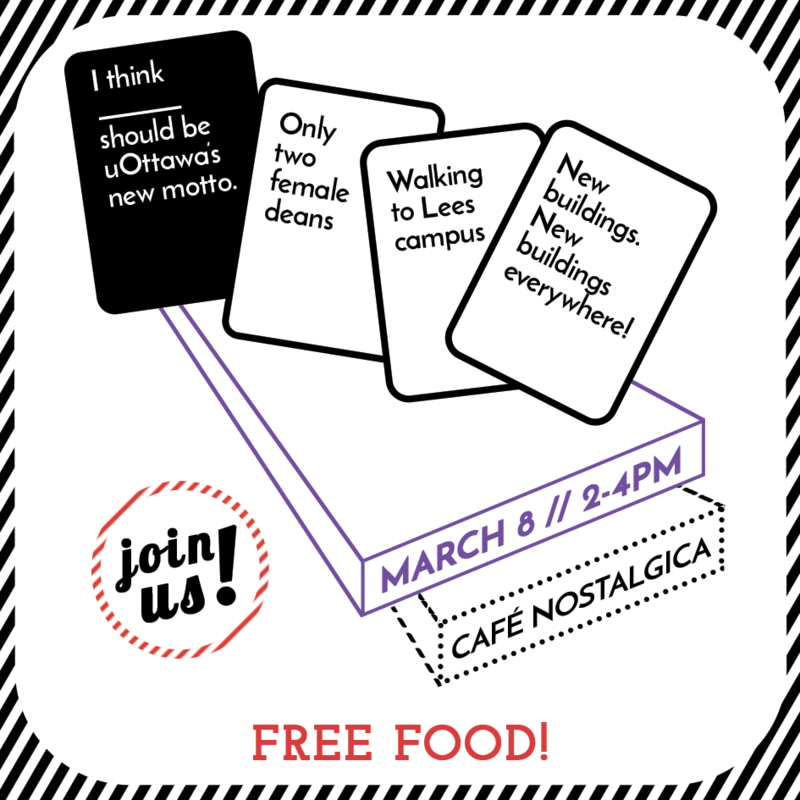 Wednesday March 8th, in conjunction with International Women’s Day (IWD), the campus associations will be hosting a game of Cards Against University at Café Nostalgica from 2 to 4pm. The game features content specific to the university community and uOttawa in particular, with a gendered focus on some of the card content for IWD. Food will be served. Thursday March 9th, at 11:30AM, the Association of Part-Time Professors of the University of Ottawa (APTPUO) will be screening Starving the Beast, to be shown at Desmarais Hall, room 12102 (55, Laurier street). The documentary examines the last 35 years of systemic defunding of universities and market-driven reform that has been commonplace in the United States, and which parallels with ideologies around higher education in Canada. Pizza and beverages will be serve. These events are supported by APUO, GSAÉD, CUPE 2626, APTPUO, SFUO, SSUO, SEIU local 2. This information was also issued in a press release. Library cuts mobilization: Collective action works! This bulletin was sent to APUO members on March 3, 2017. To see the bulletin in full click here.